When Phil Schiller, Apple’s vice president of worldwide product marketing, introduced the company’s 17-inch unibody MacBook Pro notebook at Macworld Expo, he spent a good chunk of time talking about the laptop’s battery. Touting that it would “deliver our longest battery life ever,” he even played a video of detailing the challenges of creating a better battery without taking up more space or weight than in previous models. 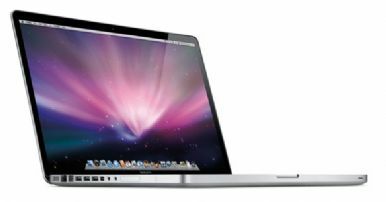 According to Apple, the MacBook Pro's Lithium-Polymer battery uses sheets of polymer plastic that can be molded into any shape, occupying less space than a traditional Lithium-Ion battery (which typically uses cylindrical cells). That makes for a flatter, thinner shape. The result is a battery with up to eight hours of run time, the ability to retain 80 percent of its original capacity through 1,000 full charge cycles, and a life span up to five years. Adaptive charging rounds out the package. Here, the notebook’s voltage changes and instead of the notebook charging the battery at a consistent voltage—which can wear down the battery’s cells)—the battery incorporates a chip on each battery cell that communicates what voltage is needed. Once this measurement has been received, the system can adjust the voltage, extending the life of the battery cells. The other result of Apple’s engineering feat is that, unlike with the MacBook and 15-inch MacBook Pro, the 17-inch MacBook Pro's battery is not easily removable or user-replaceable—a sticking point with many users. Getting a new battery requires bringing your laptop into an Apple Store or sending it into Apple and, after the one-year warranty period, a charge of $179. But Munster isn’t that concerned about the fixed battery. He points out that Apple started this trend with its iPods and MacBook Air, and that the concept of not having a removable battery is scarier than the reality. He also predicts in the next few years, all of Apple’s notebooks will incorporate the new battery technology, with limited impact on consumers. “If they say eight hours, they’re getting six, probably,” said Munster. “This covers about 95 percent of air travel.” He acknowledged that for the people who need multiple batteries, the fixed battery is a painful disadvantage—but it will only impact a very small segment of the market. Kyle Wiens, CEO of Mac and iPod upgrade instruction site iFixit, has a different view of the battery change. At the Apple booth at Macworld Expo, Wiens said he saw the new MacBook Pro with its back plate removed, and noticed that the battery itself was similar to that being used on the MacBook Air—which he considers easily replaceable. “Anyone can do this [change the battery] with a screwdriver and ten minutes,” said Wiens. Wiens did admit, however, that the non-removable status of the battery probably wouldn’t be a deal-breaker for most users, unless they were involved in travel or projects that required more than eight hours of battery life.